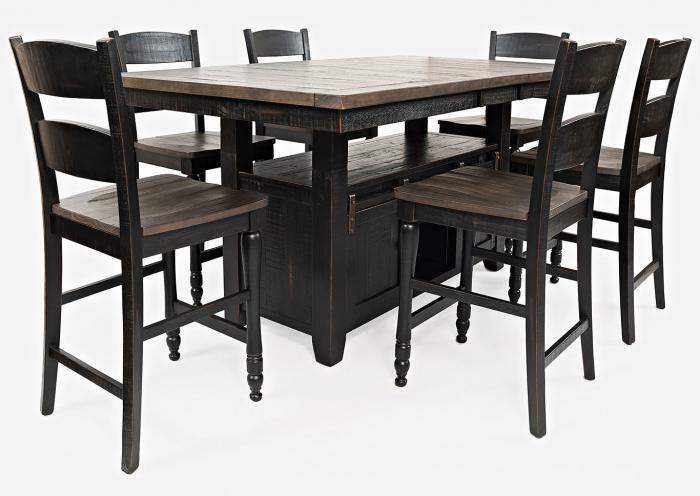 In complementing Vintage Black and Barnwood finishes, the Madison County Adjustable Height Dining Table utilizes reclaimed pine and distressed planks to create a piece with simple lines and a rustic, homey feel. A removable leaf offers flexibility, and the base features open shelving and hidden storage on both sides behind sliding barn doors. Risers allow for conventional or pub height seating- perfect for casual, open plan dining or in a greatroom. 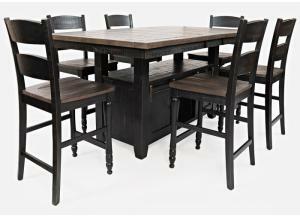 Four ladderback stools with comfortable, shaped wooden seating are included. Also available in Barnwood finish, or two-tone Vintage White and Barnwood.